The BHS Traveling Battery Transporter (TBT) offers a dependable, track-mounted solution to changing lift truck batteries efficiently. Improve productivity with this safe and durable industrial battery transporter. The TBT has a track-mounted design to precisely maneuver the transporter through a battery room. It comes with either a 15-inch-wide and 21-inch-wide battery compartment. 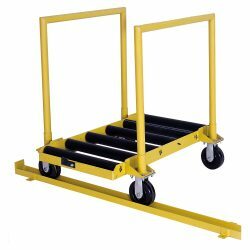 This ergonomic transporter allows one staff member to change a lift truck battery in most applications. Large 2.4-inch rollers come standard and make changing out batteries easy. The rollers are spark-proof and poly-sleeved so they last long and reduce corrosive buildup that can occur from electrolyte residue on batteries. The Traveling Battery Transporter is equipped with removable push bars for easy maneuverability and added convenience. The phenolic casters provide low rolling resistance and protect warehouse floors. The TBT features heavy-duty construction and is built to last. The transporter is rated at 2,400 pounds (1088 kilograms) capacity for heavy loads. This rugged transporter is designed to work with the Single Guidance Track (SGT-C3) and Steel End Stops (TRK-ES), which are sold separately. The track-mounted system makes battery changeouts simple and effortless. Increase productivity by reducing changeout times with the Traveling Battery Transporter from BHS. Contact our sales team at +1 314 423 2075 to find out more about Battery Carts and Carriages or to locate a dealer.